This article show you how to make re-usable PDFs. Make sure your PDF has the sections you want to change left blank. Upload your PDF on the site and you will arrive on the edit page. If you uploaded the document earlier then you can access it through the Docs library, look for this icon . From the left of the edit page, drag and drop a grey Sender Field onto your PDF and add a label e.g. 'Company Name'. To resize the field, hover over the lower or right edges (or lower right corner) and you will be able to resize it. Drag it around by clicking in the middle and holding the mouse key down. You will also see 'Signer fields" on the left hand side (in Green). 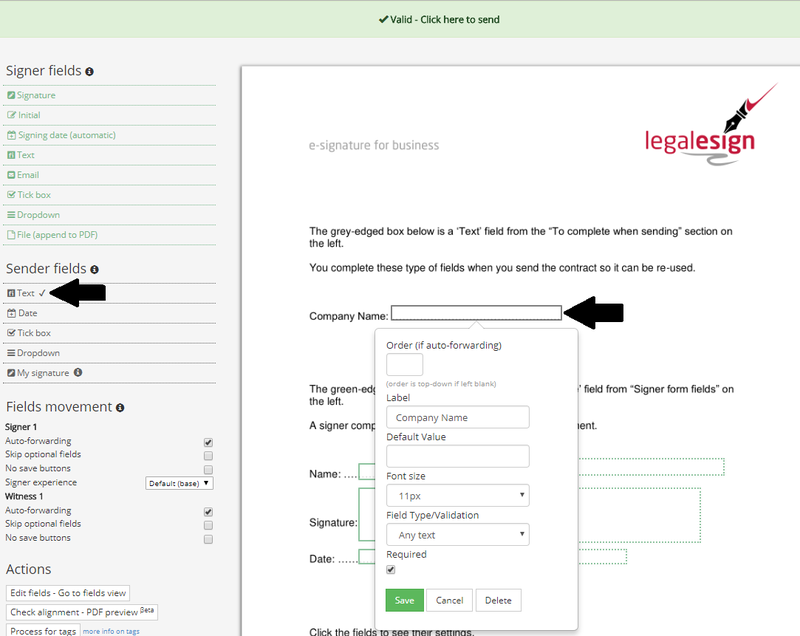 These are form fields for signers or approvers to complete. Sender fields, by comparison, are fields for you (or your team) to complete when sending out the document; these make the PDF re-usable. 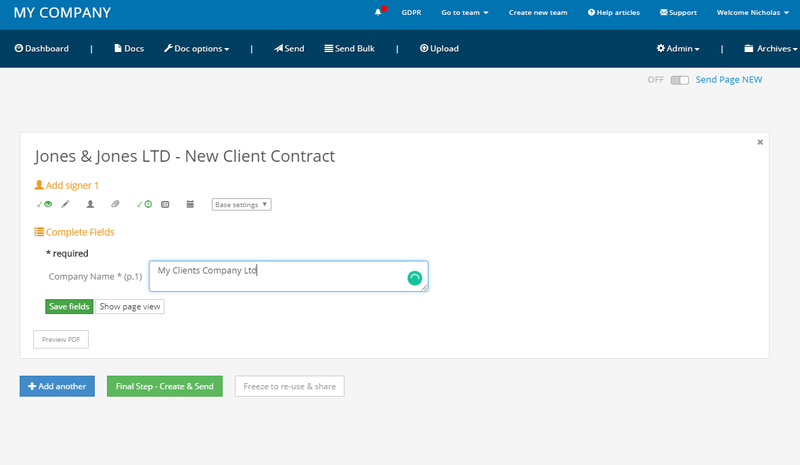 However many sender fields you add, you will need at least 1 Signer Signature field to validate the document. Drag on one of those fields from the top of the left hand column under 'Signer fields'. If all you want is an approval either tick 'approval only' just above the PDF, or use one signature box - you can still switch a signer to an approver later. Once you're happy with your fields, you can send it out. The validation box along the top of the page will alert you to any errors, but will other ways say "Valid - click here to send'". Click the Send button, select the PDF template and click 'Add document'. If the PDF template contains any sender fields, these are displayed in the section labelled 'Completed fields'. On then Send Page, the grey sender fields you added to your PDF will appear in a tabular format (click Show Page View to see them in situ on your document). Fill them out and click the Save button at the end of the section. When you understand the lay of the land, check out these form field shortcuts to make quick work of your PDFs. That's it. On the Send page you can use PDF preview to make sure your sender fields look as you expect, but otherwise click 'Final Step - create & send' to send out your document.